These granola bars are held together with peanut butter, puréed dates and maple syrup. You can use almond or cashew nut butter in place of peanut butter if you prefer. These are vegan friendly and suitable for coeliacs if you choose gluten-free oats. This recipe makes 10 bars or 20 smaller squares. Grease a 17.5cm square cake tin or baking dish with oil and line with non-stick baking paper, leaving 5cm excess hanging over the edges to help with lifting out later. Toast the oats, pecan nuts, pumpkin and sunflower seeds together in a large dry frying pan over a medium heat until golden brown, tossing regularly. Tip them into a large bowl and toss together with the cranberries, chia seeds, orange zest and ginger. Blend the dates in a food processor until smooth and tip into a medium saucepan. Add the peanut butter and maple syrup and cook over a medium heat for a few minutes, stirring, until well blended. Pour this mixture into the dry ingredients and stir everything well together until evenly coated. Spoon the mixture into the prepared tin, spreading it out evenly with the back of a spoon. Cover with cling film and chill in the fridge for 1 to 2 hours, until set firm. Lift the granola slab out of the tin and peel the paper away from the sides. Cut into five even-sized strips, then cut these in half across to give 10 bars. Cut each one in half again to give 20 smaller squares if you prefer. These will keep for up to a week in an airtight container in the fridge. 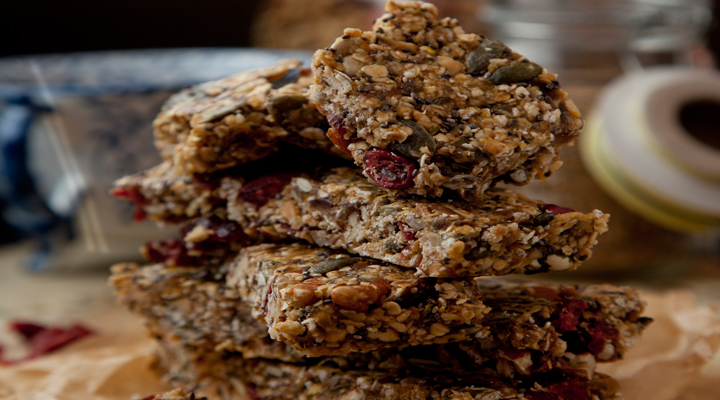 While these granola bars are full of good ingredients like oats, nuts and seeds, they’re also high in calories, so keep that in mind when it comes to portion sizes.